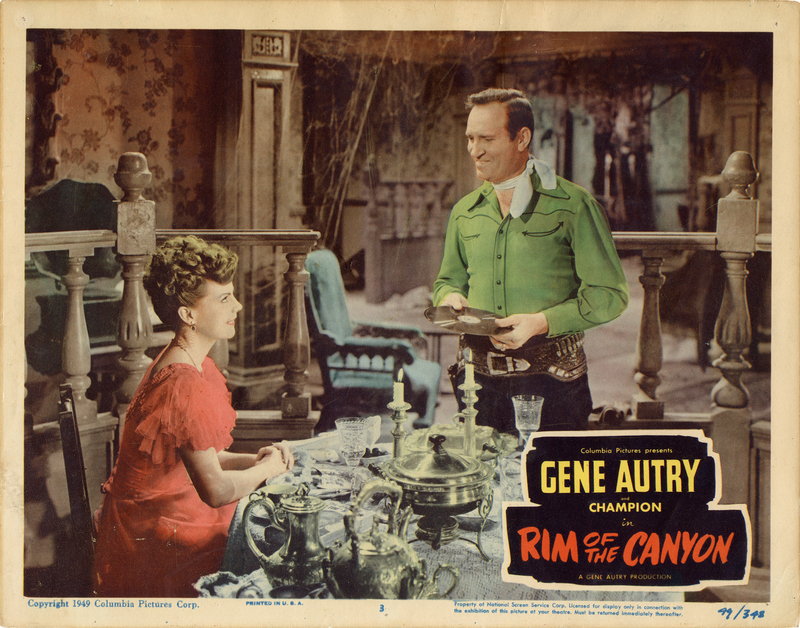 SCVHistory.com LW3205 | Film-Arts | Lobby Card: Gene Autry, Nan Leslie in 'Rim of the Canyon' (Columbia 1949). Lobby card shows Nan Leslie and Gene Autry in "Rim of the Canyon" from Columbia Pictures, 1949. Leslie got third billing behind Autry's horse, Champion. Locations include Vasquez Rocks and Corriganville in Simi Valley. Autry hadn't yet purchased his own movie ranch in Placerita Canyon. "Rim of the Canyon" is produced by Armand Schaefer and directed by John English from a story by Joseph Chadwick and screenplay by John K. Butler. Rounding out the credited cast are Thurston Hall, Clem Bevans, Walter Sande, Jock Mahoney, Francis McDonald and Alan Hale Jr. Uncredited cast members are Ralph Bucko, Roy Bucko, Bobby Clack, Lynn Farr, Rory Mallinson, Frankie Marvin, John McKee, Denver Pyle, Sandy Sanders, Boyd Stockman, Jack Tornek and Amelita Ward. Stunt performers are Jock Mahoney, Sandy Sanders and Boyd Stockman. LW3205: 9600 dpi jpeg from original lobby card purchased 2018 by Leon Worden.